I’m not one for reading the books - even though I’m told again and again I should. I’m just not a huge Harry Potter fan. 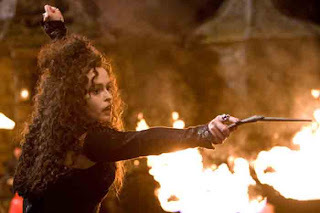 However, I highly enjoy the films and it has to be said the Harry Potter movies just get better and better. This is the first HP film I actually got super, super excited about. The film is dark and moody, visually striking and magnificent, intense and sometimes scary - I can’t believe I screamed during the movie. With Harry Potter and the Half-Blood Prince - the sixth book in the series - the plot thickens to include not the usu al trickery, but urgent themes of love and devotion. Not only are the Hogwarts students threatened by the Voldemort forces, but there is also that pesky and sometimes terrifying teenage hormone issue to deal with as well. Harry’s hot for Ginny; Ron’s finding the persistent (not to mention annoying/funny) Lavender hard to resist and poor Hermione is pining away. Ah, the angst of young love. If love 'n' romance were a minor element in the last films, it emerges as a major player this time around and delivers wonderfully. Things start off powerfully in this latest installment as both Muggle and wizarding worlds are under attack from evil Death Eaters. London is in peril as the boundaries between human and magical worlds grow more precarious. Just as Harry is about to embark on a possible romance with a girl from a railway station cafe, he is whisked off by Dumbledore to help recruit Horace Slughorn to return as a professor at Hogwarts. As we find out, Slughorn holds important secrets which offer clues to defeating Voldemort. The Hogwarts School now feels more like a dusty castle rather than a fairytale playground. There is a sense of danger lurking and the film is all the better for the darker and more grown-up undertones. This is a huge summer movie that meets all expectations. Overflowing with action, love, heartbreak, drama, humor and dazzling performances you hardly notice the length of the film, clocking in at 2hrs 33min. For the first time after seeing a HP movie, I wanted more. Needless to say, I didn’t want the movie to end. However, when it finally did I have to say the ending shocked me quite a bit. I suspect life will never be the same for Severus Snape or anyone else for that matter. Thankfully, we have two more installments to go. 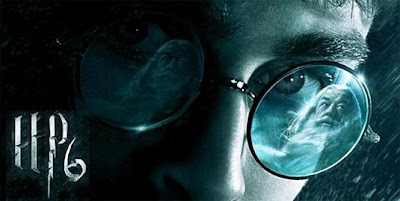 The seventh and final book, Harry Potter and the Deathly Hallows will be divided up into two films. Part 1 hits theaters November 2010 followed by Part 2 which hits theaters July 2011. I have no doubt these films will be anything less than entertaining, emotional and all around delightful. I actually wasn't looking forward to seeing this one, but I was pleasantly surprised. It's been a long time since I read the book, and that was probably just as well. I knew enough of the details to fill in the stuff that may have been lacking, but not enough to compare in agonizing detail, y'know? And I think Rupert Grint was brilliant. Even Emma Watson has managed to largely overcome her bursting speech delivery style problems. All in all, very enjoyable. I'll even take my kids to this one. I'll say it again dude. You're not a big Harry Potter fan because you REFUSE TO READ THE BOOKS. DAMMIT. I loved this movie. I was a little disappointed by a few scenes. Like the fact that Ron and his annoying girlfriend stole the circumstances of Harry and Ginny's first kiss. But whatever. Not a huge deal. All in all, I was captivated. And I agree about the new Dumbledore. First time I've not been annoyed by every scene he was in. Good thing too, since he was a MAJOR player in this movie. I'm excited to see it again with you at the IMAX! A C at best for the filming or the lack of story line? I thought it was beauifuly crafted. I heard there was a huge battle scene at the end that was completely cut out. I was hoping for something like that, but instead everyone just sorta went there own ways. BOO! But all in all I love it!